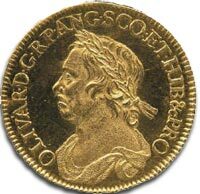 Struck in gold with bust and practically as struck this Oliver Cromwell Half-Crown is one of the great numismatic rarities. ex-Bridgewater House Collection, 15 June 1972. Prior to the sale of the Bridgewater House collection only one Oliver Cromwell half crown was known, which was held in a private coin collection. Two further examples appeared in the Bridgewater House collection, with the one offered for sale in 2009 being the finer of the two. Auction estimate May 2009 for the Oliver Cromwell Half Crown – £70,000 to £80,000 (GBP). The half crown is a denomination of British coinage worth half of a crown, which is equivalent to two and a half shillings, (two and six) or thirty pre-decimal pennies. The coin equates to one eighth of a Great British Pound (GBP), there being twenty shillings to one pound. 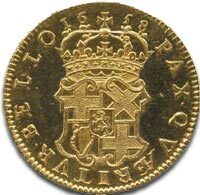 The British half crown was first issued in 1526 during the reign of Henry VIII, and was struck in gold. Milled half crowns featuring the bust of Oliver Cromwell were issued in 1656 and 1658. Cromwell was an English military and political leader best known for his involvement in making England into a republican Commonwealth. And then for his later role as Lord Protector of England, Scotland, and Ireland. He was one of the commanders of the New Model Army which defeated the English royalists in the English Civil War. After the execution of King Charles I in 1649, Cromwell dominated the short-lived Commonwealth of England. Oliver Cromwell also conquered Ireland and Scotland and ruled as Lord Protector from 1653 until his death in 1658…. more about Oliver Cromwell.